Alex's Destiny by A.K. Michaels was awesome! Alex is a middle-aged woman living in Scottland just tryin to make it through life when suddenly fate steps in to change everything. Alex knows theres monsters out there, but she hasn't ever seen them up close an in person, it takes a spooky walk in a parking lot for them to start popping up in her life. 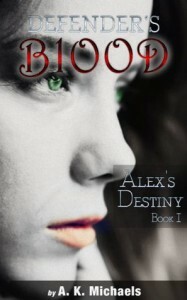 Alex gets her own guardian, a vampire named Zach to protect her and lead her on her journey. His job is to protect her at all costs, while she needs to save the world before it's too late. Michaels creates a unique world where humans are aware theres vampires, weres and all other matter of beings walking around,they have their own justice system and rules. She elevates this idea and makes it far more tangible leaving out the groupies you see in other vampire novels. I'd definitely recommend this book, it's witty and original, a great mix that'll leave you wanting to grab the next installment.